New Delhi: Once upon a time, begins S.D. Gupta, director of Jaipur’s Institute of Health Management and Research (IHMR), nobody really thought about health economics or health financing or networking with non-profits. “People wondered what I was talking about," he recalls of the early 1980s when he struggled to explain the contours of his subject. Twenty-four years and 35 research projects later, the institute has not only made “health management" an accepted term in the jargon of the development sector in India, it has also bred competition for itself. “Now we face competition for every project or research study we pitch for. We are suffering from our own efforts of making this field popular," says Gupta, as a peacock scurries off behind him across the sprawling lawns into the woods of the institute. But that’s a good problem to have, right? He agrees. Good problems such as these help Gupta place more than 100 students every year in jobs, at a time when corporate hospitals, state governments and drug makers are scrambling for skilled people. “It is a trade-off," he muses, an epidemiologist who got his doctoral degree from the US’ first research university, John Hopkins. IHMR, formerly known as the Indian Institute of Health Management and Research — it dropped the extra “I" a few years ago after the words “National" or “Indian" were made the exclusive preserve of government educational institutes — was established in 1984 by a charitable society set up by the Aggarwals promoter group that now owns a host of businesses in logistics, power and textiles. Till 1989, IHMR remained a research institute — an activity that still characterizes the institute and remains its biggest revenue churner. The teaching courses took off almost six years later in 1995, when a rejuvenated Gupta returned from US, infected with the Ivy League academician’s virus that would eventually metamorphose into the country’s best health management institute. Gupta introduced the teaching courses for the first time in 1989, but within a year he took off to John Hopkins to pursue his doctoral degree and the programme went downhill. It was totally grounded in 1994 and resurrected in a redesigned format in 1995 when Gupta rejoined it. The institute currently awards postgraduate diplomas with specialization in pharmaceutical management, hospital management and health management for administering the public health systems. It takes 120 students every year who have sat through the MAT entrance, followed by rounds of group discussion and an interview. Back in 1995, reviving the institute meant intense lobbying for Gupta with the governing board, which had not forgotten the disaster the teaching curriculum had turned out to be the first time around. Three meetings and several hours of persuasion later, the deal clincher came when he was asked half-mockingly, “Should you be hanged if you fail again, Dr Gupta?" and he agreed. “The hardest part then was to get in the students. Everyone was so sceptical," adds S.K. Puri, a doctor and retired army brigadier who is now the academics dean for IHMR. “Our first batch had only 23 students," reminisces Puri, even as his office is busy processing applications of more than 6,000 aspirants. This means that for every student that makes the cut, there are 49 others who will be turned away — a far cry from the time when the first 23 students were enrolled in with an assurance that if all went bust, Gupta’s letter of recommendation would get them into some of the better US universities. The courses in the two-year programme cut across bio-statistics, epidemiology, marketing, organizational behaviour to health economics, quality assurance and various research methods. The hospital management specialization takes the students deeper into issues such as legal framework, health insurance, hospital planning, waste, materials and equipment management. Those specializing in health management are equipped with the knowledge of programme planning, implementation, non-governmental organization management and applied epidemiology while the group looking at drug makers — a relatively new area for IHMR — branches off into drug production, marketing, clinical trials, patent laws and regulatory affairs. The flip side of being pioneers in instruction of the field is that one struggles to find faculty and textbooks, given the nature of the subject, are a bit of a rarity. “There are not many textbooks available and that means a lot of experiential learning is involved," said Puri, explaining why all the 56 modules have been written by the faculty themselves and are regularly updated. More so, these modules are taught for 15 days each and followed up with presentations and term examinations, making for a rather hectic pace of studying. It keeps the students on their toes, and simultaneously leaves ample time for the faculty to invest in the other three institute verticals: research, training and consultancy. But the institute is equitable in keeping people on tenterhooks. It asks the students to rate their teacher after a module is over, on a scale of one to five. A score of less than three, marches the faculty off to the director’s office “to discuss ways for improving that module", as Gupta delicately likes to put it. Many institutes give the cliché of how they carve out students’ personality and build communication skills. IHMR walks the talk. For the first seven days, every new student is put through something called “human process labs", in which they are fielded before half a dozen behavioural scientists. They are then put through ice-breaking communication exercises, group dynamics, games and therapy sessions, with some students coming away with a classic confessional, bawling-on-the-couch-before-a-shrink experience. A good portion of IHMR students comes from the smaller, mofussil towns and such “labs" help add confidence and effervescence to their diligent and malleable minds. “Students come from different backgrounds and such exercises harmonize them, bond them together," said Puri, who specializes in disaster management and hospital administration. The academician, who used to be a paratrooper in the Indian army and went to Sri Lanka in 1987 as part of the controversial Indian Peace Keeping Force, had ample opportunity to master his subjects. He had put the 1,000-bed hospital in war-torn Jaffna back on track, battling insufficient supplies of oxygen, blood, anaesthesia and linen even as casualties poured in faster than his hands could work on them. Managing any hospital — even the trickiest ones — seems like a pudding after that, says Puri. His tryst with war-like life situations seems to have rubbed off on his students. “One thing that this institute taught us was crisis management. Every student coming out of here is ready to say ‘yes’ to any challenge that comes his way," said Sangeeta Tikyani, a pass-out of 2007 batch and currently employed with Gujarat government. In charge of district hospitals in Junagadh and Bhuj, she is upgrading them to qualify for accreditation from the National Accreditation Board for Hospitals. She turned down several offers from corporate groups to choose this because “there is so much to do in public health care and the fruits of my labour are so quick to come by". Some others are less altruistic. Pankaj Kumar, 26, and Tikyani’s junior by a year who has also been hired by the Gujarat government, is eyeing a business in medical tourism over time. Kumar did his bachelor’s in hotel management from Lucknow and with his latest expertise in hospital management, he believes he has covered both the bases. Students such as Tikyani and Kumar are attracting recruiters over the years varied enough to qualify for the salad bowl. Corporate hospitals such as Apollo Group, Max Healthcare and Wockhardt Hospitals are scouting for recruitees along with information technology firms such as Tata Consultancy Services Ltd, Infosys Technologies Ltd and Wipro Ltd, drug makers Cipla Ltd and Ranbaxy Laboratories Ltd, public health organizations such as Oxfam International, HelpAge India and Janani (of Patna). Interestingly, the biggest employer in IHMR is the government of Gujarat. Its peers, the governments of Madhya Pradesh, Rajasthan and — more recently — Orissa, have also begun catching up. “IHMR students are enthusiastic, who won’t mind going to tier II cities and rolling up their sleeves to get their hands dirty. They are open-minded, welcome fresh learning and have good handling of crisis situations," said Kumar S. Krishnaswamy, group head-human resource development for Wockhardt Hospitals, who hires 10-15 students every year from the Jaipur institute of his total recruitment of 25 freshers. Krishnaswamy calls IHMR his first preference, taking precedence over the more publicized ones such as the Tata Institute of Social Sciences (Tiss) in Mumbai as most of the latter’s students have reservations going into the smaller cities, places where most of Wockhardt’s new hospitals are coming up. The course fee of Rs3.40 lakh — along with a laptop, insists Puri — for an entire course doesn’t stick out as an outlier in an industry when its metropolitan counterparts charge double that amount. 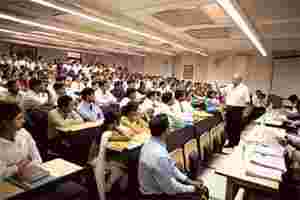 At an average yearly pay of Rs2.8 lakh, the salaries are a pittance by most reasonable standards for a management institute. In fact, the C-fore survey places Tiss a close second to IHMR, in good measure due to Tiss’ higher pay packets. And the management is aware of it. “We don’t fake numbers and we go by the salaries which employers offer. Many a time, especially with governments, the perquisites are not added and that artificially deflates the numbers," said Puri. However, what the institute loses due to the pay cheques, it makes up in its excellent infrastructure and environment-friendly architecture of the building that stays surprisingly airy and lit up even when it gets its load of power cuts. One could call them good managers of scarce resources in more ways than one. More than half the campus is lush green and is irrigated fully by chemically treated water that had been used by the institute kitchen and hostels. “Hundred per cent of the rain water is harvested," Gupta says proudly. IHMR is the greenest piece of land in the vicinity. IHMR has a rich heritage in research with 35 projects that it has done or is involved in currently. Research projects also brought in the moolah that kept the institute running, even though there is now a deliberate attempt to shift reliance from the erratic income stream of research to a more stable flow from admission revenues. The institute has worked in close collaboration with Unicef, the World Bank and USAID, among other global aid agencies, is a district-level partner of WHO and has done surveys and evaluation for the Union ministry for health and family welfare, Planning Commission and the Indian Council of Medical Research. That makes it full circle for IHMR and Gupta. Gupta recalls how in 1988 the health secretary had rubbished the findings of a USAID-funded proposal he had tirelessly worked on, by asking him to tell them something they didn’t already know. “Now they call us," he says with a satisfied grin. IHMR also boasts of agreements with a dozen universities such as John Hopkins, New Jersey Institute of Technology and University of Heidelberg in Germany. “We along with Hopkins, monitored setting up of the Afghanistan health system that had totally broken down after the war in 2003. Currently, we are working on a multi-country research on Future Health Systems funded by (UK’s) DFID," said L.P. Singh, dean-research in IHMR. Two other interesting projects that have are yet to develop a full-blown identity of their own are the consultancy firm Total Hospital Solutions (THS) and an activist cell working on women issues called the Gender Health Research Centre. THS was envisaged to provide support to upcoming and existing hospitals on project feasibility, designing, financial planning and manpower recruitment. The promising venture has gone slow and almost cold as it is constrained by the faculty’s inability to teach, train, research and consult, all at the same time. The hectic pace of studies in the institute — term exams on a module every fortnight, interspersed with reports and presentations—has led to a sort of pedagogic amnesia. The process has created a rote-and-barf routine on the syllabi as the students are always on a trot, rushing to the next module — a fact that Tikyani and her IHMR batch mate, Kapil Dev Singh agree to. Both Puri and Gupta acknowledged this flaw and hope that moving to a semester system from this year on, will remedy that. That brings us to another peeve, this time from the recruiters. Krishnaswamy minces no words here: “Business orientation has to be there. The students lack business exposure and are weak in numbers, finances. If they have to head a unit or a hospital in a few years, they will have to make sense of the top line and bottom line." That’s a bitter pill but the only one prescribed to IHMR, in its otherwise impeccable wellness scores.